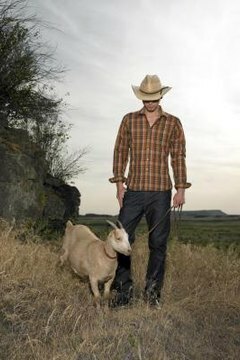 There's probably no greener way to clear brush off a site than by using goats. They're not gasoline powered, they're relatively quiet and all that brush gets repackaged as manure. That waste material can be composted and used as organic fertilizer. Goats actually prefer eating browse, better known as weeds and brush, to consuming grass. They are natural browsers, not grazers. Since all goats will browse on brush, you can make your choices based on availability, among other factors. Avoid using active dairy goats, as constant exposure to heavy brush can cause udder damage. Goats you're raising for their coats, such as cashmere or angora caprines, likely will suffer damage to their hair while performing brush control duties. Pygmies can do the job, but they're smaller so the work takes longer. Small goats can't reach as high when standing on their hind legs to browse. Larger meat goats, like the Boer, do a good job. You also can mix different types and sizes of goats, with the little guys thoroughly cleaning up what the big guys left behind. Whatever type of goat you choose, make sure it is healthy. Check the teeth carefully to ensure they are in good condition and the goat has no apparent dental problems. Before you set off with your goats on a brush or vegetation-clearing project, visit the site to look for plants toxic to your animals. These include common plants, such as oleander, jimson weed, lupines, larkspur, nightshade and boxwood. Goats avoid most poisonous plants, unless they are starving, but you must let the property owner know that the goats won't clear out that vegetation. If there are large numbers of poisonous plants, it's better to forego the project than risk your goats. You also don't want to put your goats on property that has been heavily sprayed with herbicides and pesticides. It's likely there are plants on the land that aren't toxic to goats, such as poison ivy, that can cause a goat handler a problem when touching the goats. If you leave your goats on-site for a large project rather than keep watch over their brush-clearing efforts, you'll need to fence them in. Not only are you keeping the goats on the property they're supposed to clear, but you're keeping potential predators out. If the area already is fenced, but not for goats, you can install wire mesh along the fence line. If the acreage isn't fenced, consider using goat net wire. Langston University describes this as 47 inches high, with 10 horizontal strands and a 1 foot spacing of vertical wires. The low tensile version bends easily, while the higher tensile type is harder to bend. The advantage of the latter is that it retains its shape should a heavy object fall on it. You also must discuss with the landowner what type of fencing can be placed on the property. While the browsing should provide the food source for your goats, you must make sure they have constant access to fresh, clean water. If a creek flows through the property or there is a pond on the premises, you probably don't have to provide water. If not, you must arrange for the goats to have sufficient water. In warm weather, shelter probably isn't necessary if there are large trees on the property, but when clearing brush in winter your goats will need some type of temporary shelter. What Breeds of Goat Eat the Most Weeds? What Kind of Shelters Do Goats Need? What Kinds of Goats Live in Greece?